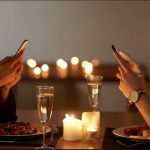 Using a dating app can have its advantages, as it provides its users with a massive range of potential partners to consider that they may have never encountered otherwise. 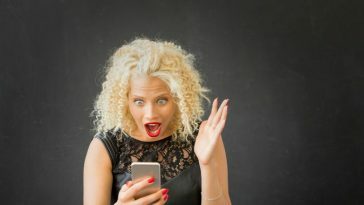 However, the ability to simply dismiss an individual with the swipe of a finger could also be encouraging people to be pickier than they may be usually when meeting others in real life. 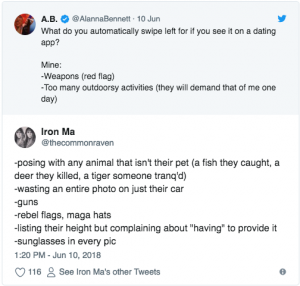 Writer Alanna Bennett was curious to find out what makes people automatically swipe left when scrolling through a dating app, which is why she posed the question to her 18,000 followers on Twitter. 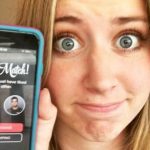 She received a wide array of hilarious responses, with some of the replies referring to very specific elements of dating profiles that are massive turn-offs for many. “Cigarettes, giving the finger, shirtless pics, every photo is a group photo, pics in the gym, no pics, obviously fake pics, CrossFit, bad grammar… I could go on. Guess I know why I’m single,” one person wrote. 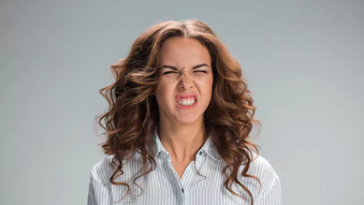 Many people expressed a shared dislike for photos that featured weapons of any kind, while others also pointed out their aversion to too many group pictures. 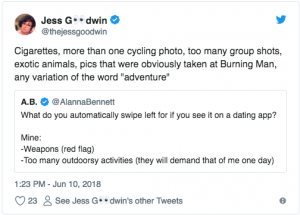 “I GUARANTEE if you have more than one group pic on a dating app I’m gonna be more attracted to one of your friends than I am to you, it’s what’s happened every time,” Bennett wrote. 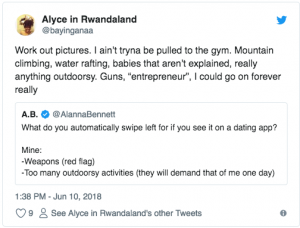 Many of the Twitter users who joined in the conversation stated that they found too many references to an active or outdoorsy lifestyle off-putting. 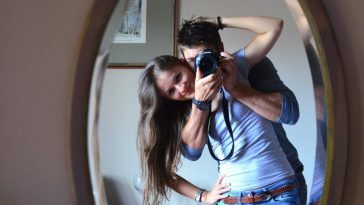 For some, coming across the Twitter thread made them feel extremely grateful for their happy relationships. “Honestly this all made me turn to my wife and say ‘I’m so glad I found you,’” one person remarked. 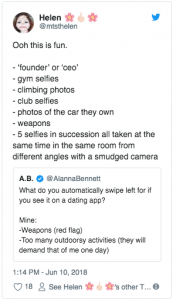 In March, a survey conducted by dating app Badoo found that more than half of women looking for a relationship with a man would swipe left if he included a photo of himself with an attractive woman on his profile.